Tim Schafer's Double Fine has gone from a heavy metal journey through hell to an RPG about cute kids trick-or-treating. Last month, Tim Schafer said that Double Fine had four games in development with various publishers. 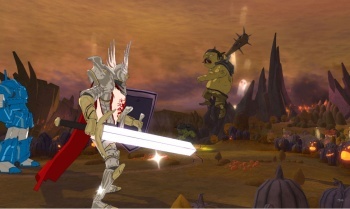 THQ is apparently one of those publishers, which will be helping Double Fine out with the 1up revealed Costume Quest, set for release in the Fall on Xbox Live Arcade and the PlayStation Network. 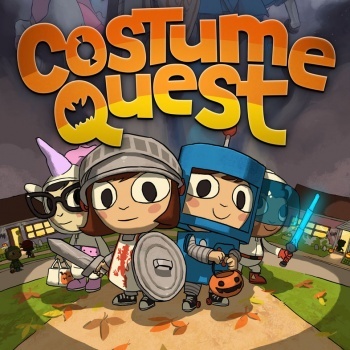 Costume Quest is not what you might expect from a studio that last put out Brutal Legend, but it's just what you'd expect from Tim Schafer and Double Fine. However, the concept was actually created by the studio's lead animator Tasha Harris, who is leading the project through development. The game seems inspired by Earthbound, the quirky SNES RPG, as it stars a young lad from the suburbs searching for his missing sister on Halloween after she's kidnapped by a monster that thinks she's a real candy cane (and not just a girl dressed as one for the holiday). He and his 4 companions must battle and quest their way through the night to try to save her. One such quest requires that the hero dress up as the Statue of Liberty to get into a party, tasking the player to craft the various pieces of the costume. Companions have special abilities that correspond with their unique costumes, such as a knight that uses his shield and another that has wheels in his shoes for fast movement. Other costumes shown in the logo are a Jedi-type character and one with a horn that I can't make out. Earthbound is a favorite of mine, and Costume Quest definitely has the same kind of vibe even though the screens only show the hero battling against goblins and not skateboard punks. With Double Fine's sense of humor and off-beat development history, I think adventure-RPG fans have a fun experience to look forward to here.